Soooo... one of the hot gossip topics this past week was something we here at Islandista pointed out two years ago - that supermodel islandista Naomi Campbell is well... going bald. No other way to really put that delicately. Years of weave abuse have done for Naomi's hairline and it's been gone for a good while now. Just seems like the rest of the world only just realised how scary it was under Naomi's weaves when the Daily Mail buss this pic of her with a huge bald 'patch' on a photo shoot. Of course, this does not come as a surprise to Islandista. 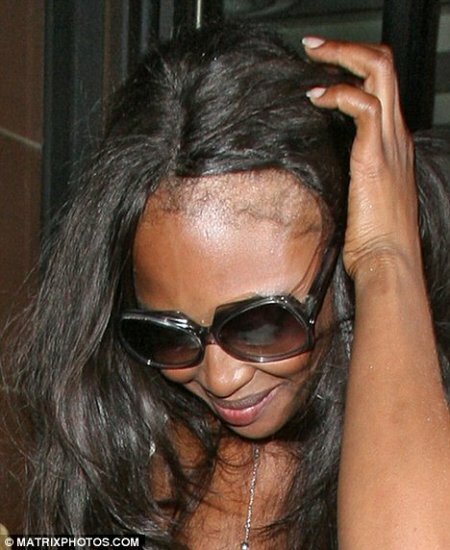 We analysed it in our post 'Oh Naomi...' back in June 08, when another pretty shocking (at least to us) pic of Naomi's hairline surfaced (see below). She was just pushing her hair back from her face but we could see what was going on - serious traction alopecia, the bane of too many black women who stress their hair out. Sigh. You would think the world's foremost supermodel would have better people taking care of her hair but as we ponder on it, this may neccesarily be the case. Think on it. For years, Naomi was the only black supermodel around. Then one of two - her and Tyra. Sure, there were other models of color on the scene but often, Naomi was the only one at the level she was at - at the top shows, at the top photo shoots, bagging the top campaigns etc. And quite likely, being set upon by many hairdressers who were just not used to or equipped to do black people's hair. If there were x-amount of white models at a show or shoot and she was the sole black one, chances are, she was regularly getting her hair styled by the same folks doing the white models' hair. But it does make you wonder - if Naomi is all too willing to 'get on bad' over a pair of jeans or a phone or luggage, why she didn't pick her battles? Get on bad to have your hairdresser Shauna-gaye from Brixton, brought in to style you at all times! There's a battle she should have fought.